I love palmiers. This is, hands down, my favorite, go-to pastry, anytime, anyplace. I first fell in love with them when I was studying abroad in Sevilla, Spain. I would stop at the local corner bakery every morning on the way to class and pay a few pesetas for a buttery flaky treat for breakfast. I'd eat it while walking down the street, enjoying the culture and ambiance, before delving into Spanish art and politics. To this day, I must try a palmier from whichever bakery I visit, and I've often made them at home. So when I saw this version, I was a bit disappointed it wasn't the traditional shape that I love so much. 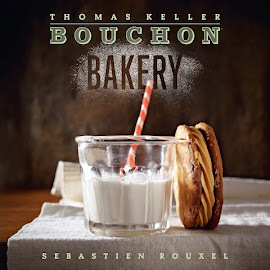 After reading through the recipe, it felt to me like it wasn't as in-depth and detailed as most of the Bouchon recipes. For example, it doesn't state how to cut the pieces, as in, from which side of the dough, the long side or the short side. I did it both ways to try it out, and I preferred the shorter pieces. I did have trouble with the layers separating, into three chunks instead of one complete piece. The last folds never quite stuck together properly. Also, I don't think the temperature or the time was correctly noted, because it took much longer for the pastry to get brown, about 10 extra minutes. Once cooled, only some of the slices were intact enough to use, most of them had trouble sticking together. I helped out by eating the bits that fell apart. Whoops! To make the sandwiches, I didn't make the raspberry jam in the book, because I had a lovely jar of lingonberry preserves in my pantry, so I used that instead. The tartness of the lingonberries was a nice contrast to the sweet pastry. I may have needed to cut the slices a bit thinner, since the sandwiches were a bit difficult to eat, but my husband had no problem polishing off a few. They are also delicious just by themselves. In the future, I'll take away a few tips and techniques from this recipe, but I'll probably make some adjustments. I'll keep the addition of sugar in the last two turns, but I'll roll out the pastry and shape it into the traditional palmier shape. Overall, very tasty result, but with a few adjustments, it could be even better. Typically I like my puff pastry to be simple, flaky and buttery, with the filling providing the sweetness and flavor. However I've grown to love sweetened laminated doughs recently thanks to my new-found love for kouign amann. I'm getting ahead of myself because that's actually made more like croissant dough which is the next part of the chapter, but in any case, the palmier is similar in that, sugar is layered into the dough so when it bakes the sugar caramelizes and makes for a very crisp almost brittle-like texture. To make this dough I cut off a portion of a full batch of dough at it's third turn, which is the stage where sugar is added to the layers to make palmiers, saving the remainder of the plain dough for other projects. In doing so, my strip of dough was not as stable as the full slab so rolling it out caused the layers to shift slightly, which you can see in the above. It didn't disrupt the texture or flavor, just in appearance it's not perfectly straight. I don't mind but I thought I'd at least explain why they look like that. Here are the slices ready to bake. As Tania mentioned, the recipe didn't state which way to cut, so I cut from the short side. The long side didn't seem right as they would have yielded strips rather than rectangles. The layers really do expand in the oven and loosen as well. The palmiers didn't stay in tact and some of them broke apart. It also took me an additional 10 minutes to get them a nice golden color. I liked the idea of turning these into sandwiches with jam in the middle and powdered sugar on top. 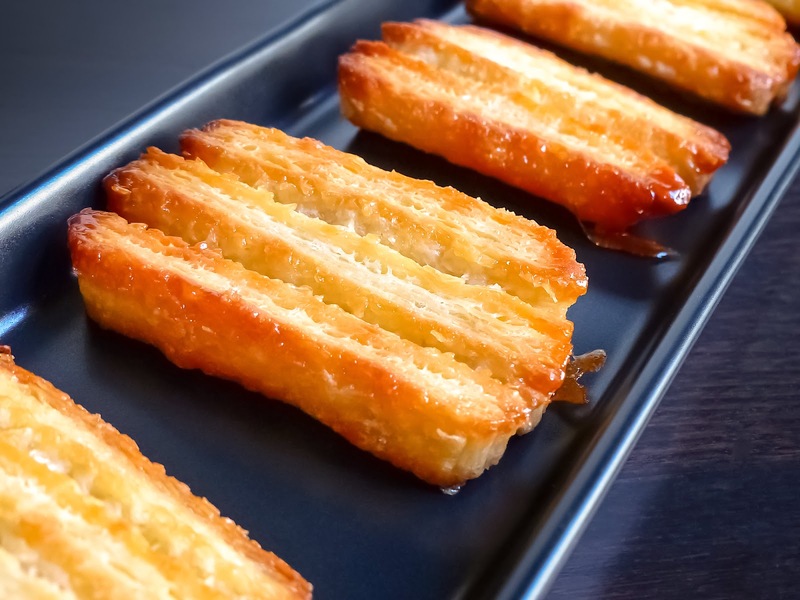 The flavor contrast was nice however it was a bit too crunchy biting into two palmiers. The book says once you assemble, the sandwiches are good for just a few hours because after that they soften. I actually waited to see if they would soften, thinking I'd prefer that, but they actually kept their crunch after 3-4 hours. 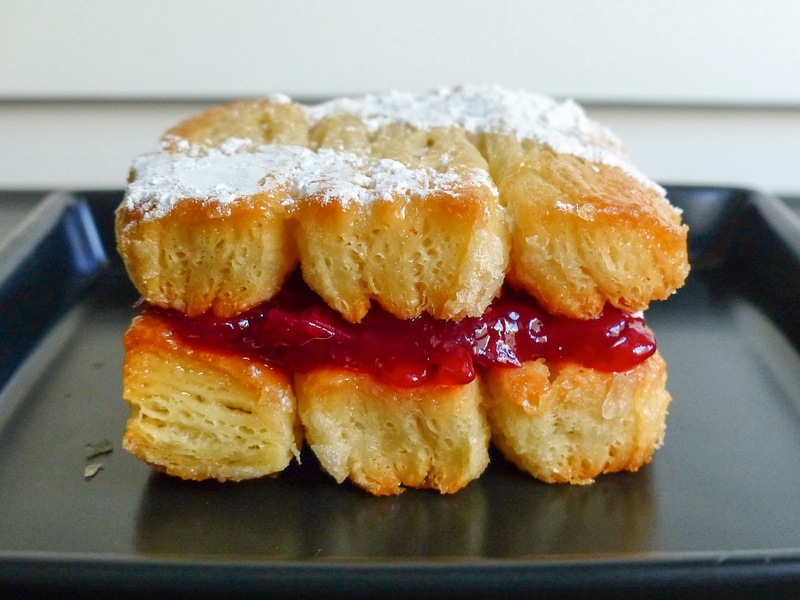 Perhaps I'd tweak this concept and serve the palmiers as they are with a little bowl of jam for dipping.